Elex's Magic 8-Ball is yet another 'Magic 8-Ball'. 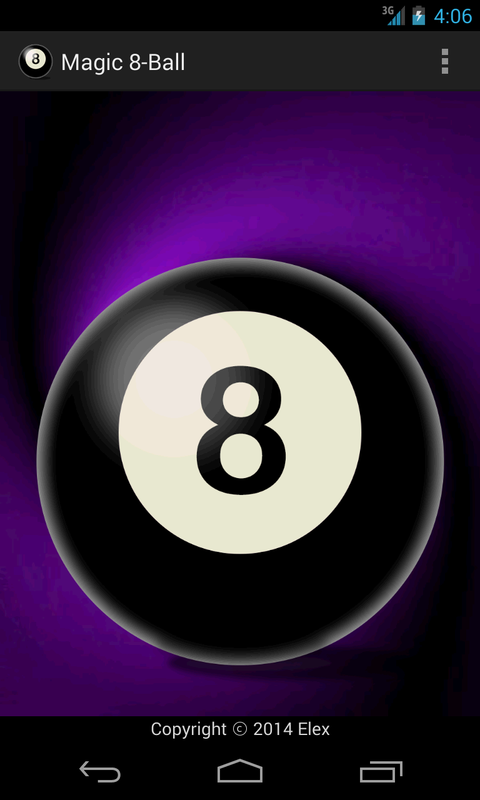 When you have to decide something, ask the Magic Ball, and shake it! If you need a friend to talk to, the Magic ball can be your friend. 1. 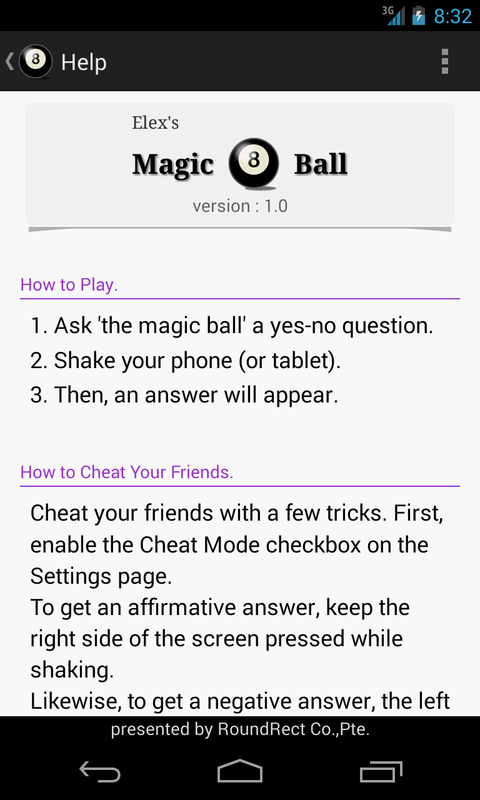 Ask 'the magic ball' a yes-no question. 2. Shake your phone (or tablet). 3. Then, an answer will appear. Cheat your friends with a few tricks. 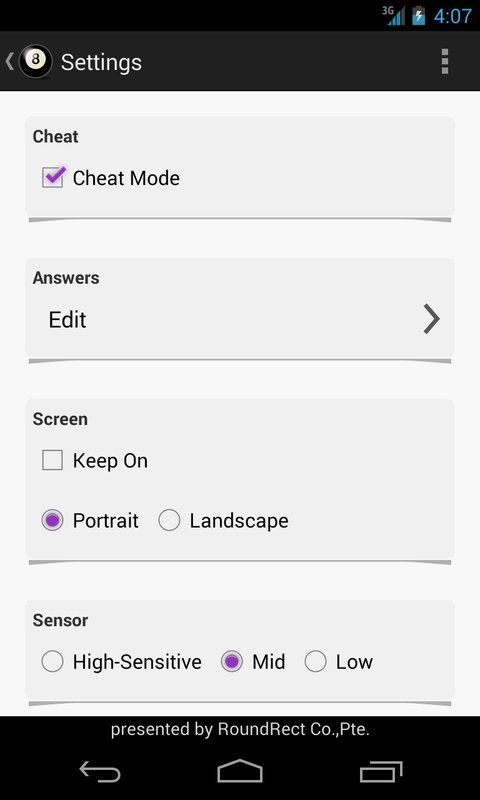 First, enable the Cheat Mode checkbox on the Settings page. To get an affirmative answer, keep the right side of the screen pressed while shaking. Likewise, to get a negative answer, the left side. Please notice that the answer is just a random result. It's totally free. And it doesn't have any banner. 20 answers are predefined. Users can add a new answer, edit an answer, or delete an answer. You can make your own answer list. Well, one of usages is that making it to a dice with numbers.. though..
You can manipulate the result by pressing the screen while shaking. 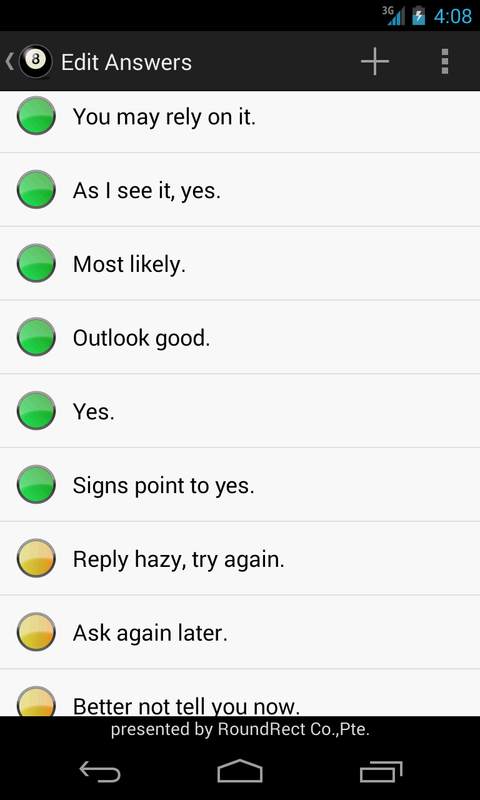 Hold down the right side of the screen to get a positive answer, and hold down the left side of the screen to get a negative answer. Shake the phone to get answer. But, when you're too tired and don't want to shake, you can do it simply by clicking a menu button on the action bar. Thanks to the TTS engine, now the Magic ball can TELL you. You may have to set some TTS related options on the system's Settings. I hope you do not miss the rotating whirl inside the ball.